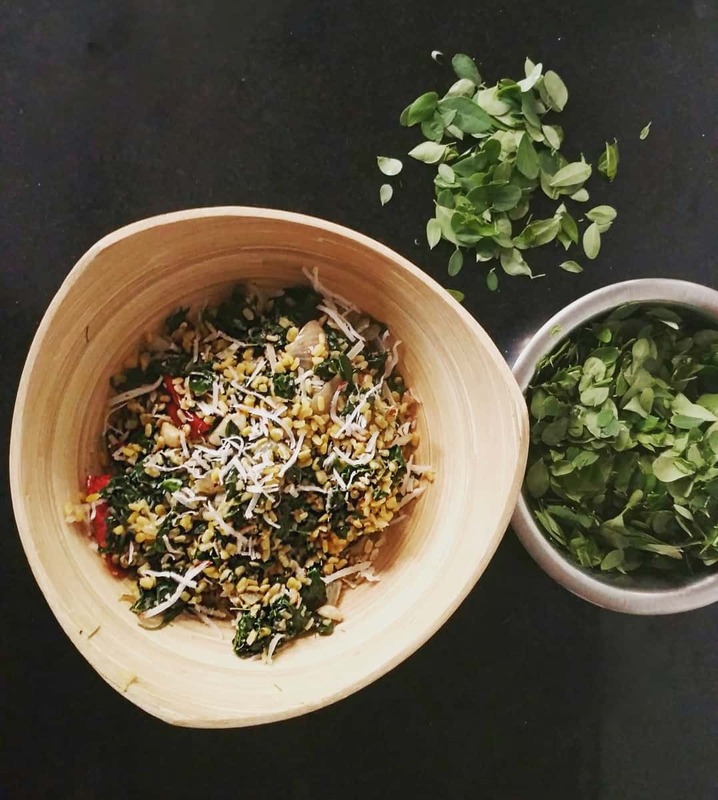 A nutritive powerhouse,, where Moringa or Drumstick leaves combine with moong dal and coconut flakes to bring forth a rustic, simple yet delicious preparation. Delicious balanced meal indeed! Moringa/ Drumstick greens are not new to me as they are to some who are waking up to the West embracing this near-superfood. Moringa oleifera, known popularly as Drumstick tree, is indigenous to India and Pakistan and are grown for the nutritive and medicinal properties of its flowers, leaves, pods (drumstick or munga) and bark. Moringa greens contain more iron than spinach (4 mg; 50% RDA), more vitamin C than oranges (51.7 mg; 86% RDA), and more potassium than bananas (337 mg; 7% RDA). What is more, it has a high protein content of 9.4 gms (one of the highest protein content vegetarian sources), essential good fat (monosaturated) in the form of oleic acid, Vitamin A (7564 IU; 252% RDA) and Calcium (185 mg; 18.5% RDA). *All values for 100 grams of Moringa leaves. Source: USDA National Nutrient data base. In fact, it has been cited that “daily use of leaves and seeds of this plant could significantly provide the recommended dietary allowance for the Vitamins C and A, and minerals, such as calcium and potassium” [Source: National Center for Biotechnology Information]. I’m thankful towards my mother for introducing Moringa greens early on in my diet, for these leaves play a significant role in Odia cuisine. My mother was raised in Bhubaneshwar, Odisha (her father and siblings converse in Odia to this date), and hence the cuisine naturally made an appearance ever since my childhood. 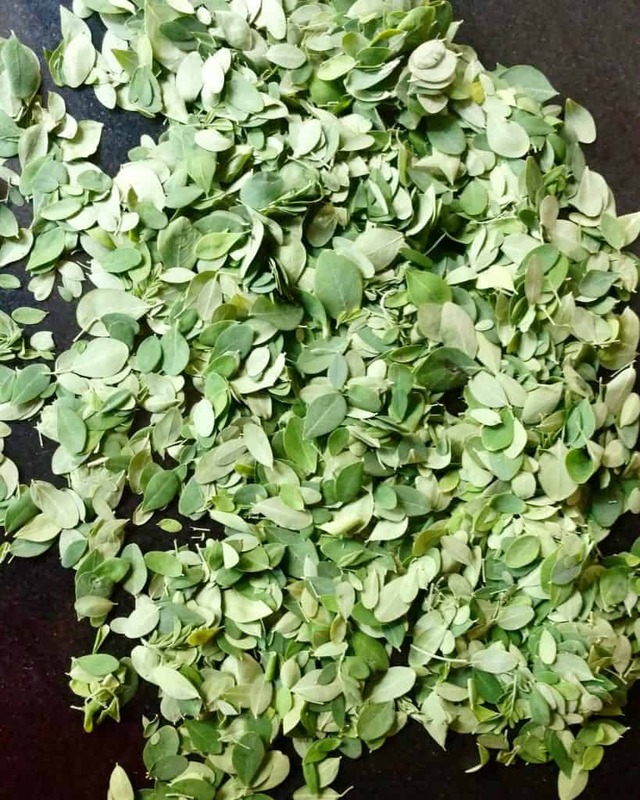 Known as Sajana in Odia, these greens are frequently added to several recipes. The reason I love Sajana Saag is that it is simple, easy to prepare, fragrant and delicious in all its humbleness of three main ingredients – Moong dal, moringa leaves and coconut flakes. That’s all! Pair the Sajana Saag with rice or phulkas as I did, and relish! Soak the moong dal for 5 minutes. Rinse and drain. In a pot, fry the moong dal in a tsp oil till golden. Then add ½ cup water and let the moong dal cook in it. I usually let it boil till the dal is al dente, since I like it if there’s a slight bite to it. Set the dal aside. In a non-stick pan, heat the remaining oil, add cumin seeds and let them splutter. Add onions and garlic, cook till onions are golden. Add red chillies, washed drumstick leaves and sauté till they’re soft. Add turmeric, hing, salt and moong dal. Turn the heat off. Sprinkle grated coconut or coconut flakes and relish! Moringa leaves are fibrous and need to be stir-fried till soft. Add few drops of water if necessary. 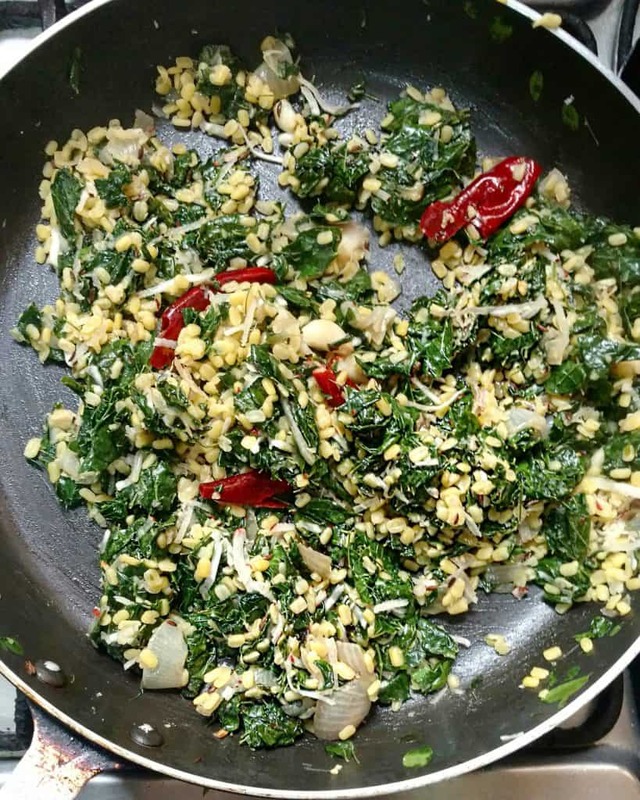 Also, their slight bitter aftertaste is a typical characteristic, which might need a bit of getting used to, just like methi/ fenugreek leaves. Mustard oil is what gives this stir fry its authentic Odia flavor, but you could choose any other oil if you dislike its pungent flavor. Cooking moong dal in milk would render a sweet undertone to the stir fry. Use water instead if you wish to avoid that, like I did.